As soon as you drive through the gates to the Bower at Broulee, you can feel the tension ease from your shoulders. 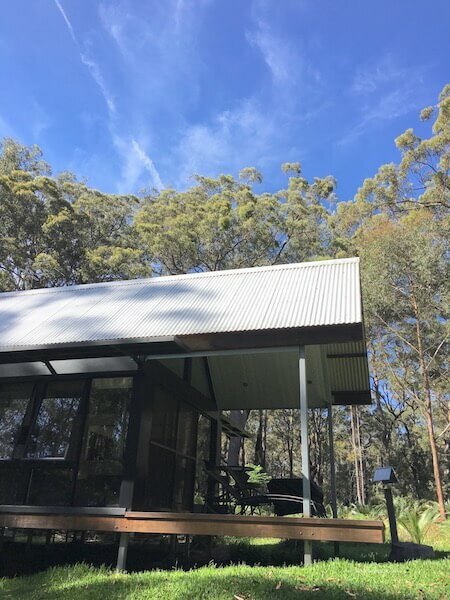 The driveway winds around through a forest of thick gum trees and luscious ferns, bringing you to your hosts, Sue and Mark Berry. 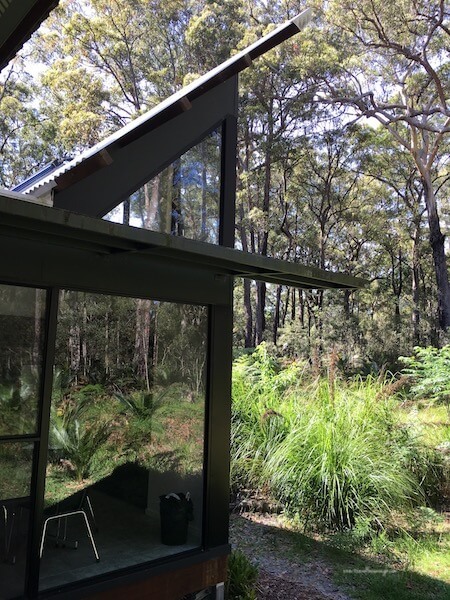 Mark and Sue designed this retreat with the behaviour of the Australian Bowerbird in mind. Male bowerbirds construct elaborate runs decorated with brightly coloured objects in hopes of attracting a mate. The five cabins, or ‘Bowers’, are painted in bold colours and situated on the property just as a bowerbird would shape his run. Nestled into the bush, guests are provided absolute privacy. It’s the perfect place to escape crazy city life for a romantic getaway in natural forest. After getting the lay of the land (i.e. checking in), you are directed to your own ‘Bower’. When you walk through the front door, soothing music greets you through the surround sound and the aroma reminds you of a high-end spa. As you look up, because you feel compelled to do just that, high ceilings and abundant windows make the place feel huge. Nature is around you everywhere. Even the light fixtures reminded us of a bird’s nest. We felt cocooned in our newfound oasis. ‘Wow’ escaped our lips more than once. It was way more than we expected. The thought that went into the design of the ‘Bower’ is evident. Working with architects, Sue and Mark knew exactly what they wanted and their architects sure did deliver. Floor to ceiling windows reveal the natural beauty that’s all around you. Glance up and you’ll be rewarded with sky-views and wildlife flittering in the treetops. 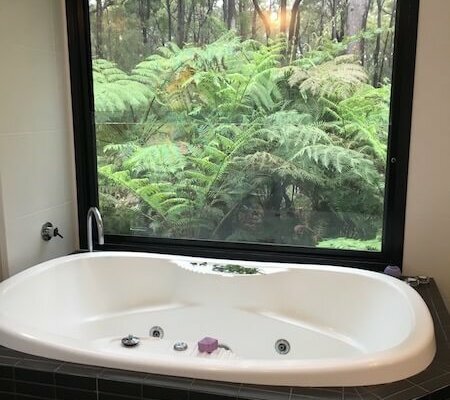 In the bathroom, a deep, soaking spa tub looks out on to the bush through a large picture window. A large double-headed shower suggests a romantic rendezvous, but let’s keep this PG rated…Don’t worry about privacy though – that’s in spades here. As you move through your ‘Bower‘, you see thoughtful touches everywhere. The fireplace, expertly stacked with fresh firewood and kindling, is ready to light. The gas barbecue on the back porch is well oiled and ready to fire up. Quality kitchenware that is supplied for your ‘self-contained’ stay, makes you feel like you’re dining in a high end restaurant. 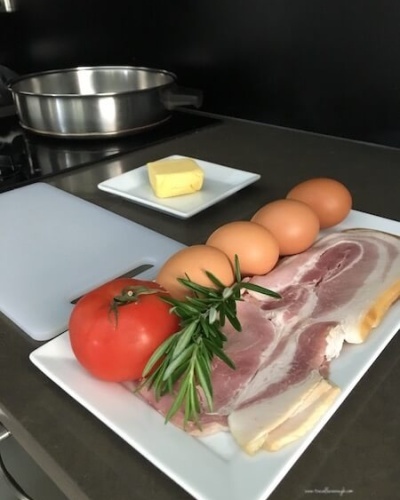 In the fridge, breakfast awaits you for the morning: farm fresh eggs, slabs of bacon, delicious looking sausages, ripe tomato for grilling, pots of jams and butter, as well as croissants, bread and cereals. Seriously I don’t think I could eat that much in two days if I tried! The Bower at Broulee is situated adjacent to a nature reserve, so the wildlife is abundant. We saw a swamp wallaby, with his front arms just a little too short to access the food he was after, jump for it instead. He looked like a kitten in a Christmas tree swiping at an ornament just out of reach. Hilarious. Meanwhile, butterflies bounced around the native flowers seeking the nectar they crave. 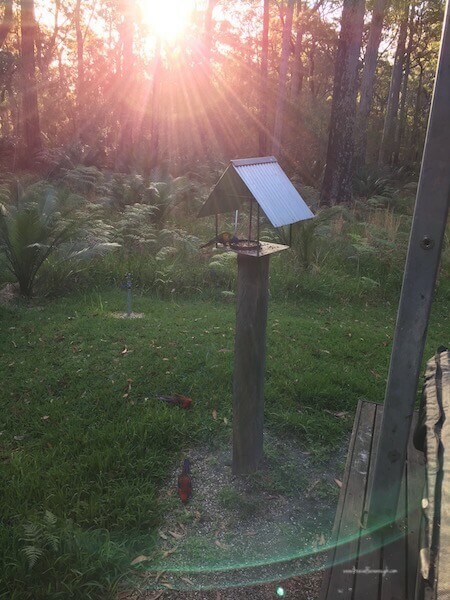 At night, you can hook up the spotlight to the post on the back porch searching for gliders, bats, possums and other nocturnal wonders. And the birds! With so many rosellas, lorikeets, kookaburras, and firetails about, it made us feel like WE were the ones on show. Of course, we cheated a little by filling the bird feeder just off the back porch with the provided seed. The serenity of the place allowed us to find each other again. It was a joy to wake up together, listening to the birds call and the surf crashing on the shore nearby. The surrounding area has a lot to offer as well. Quaint villages offer a host of opportunities for exploration. You can take an easy stroll on the property along the Illawarra track. 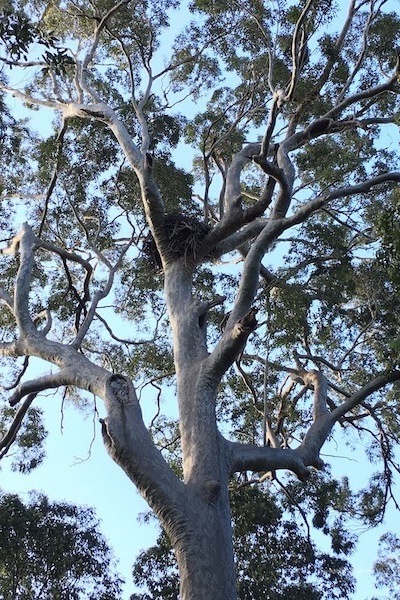 Take a small detour to spot the ginormous nest of a sea eagle. Our hosts keen attention to detail made it tough to leave the comfort of the ‘Bower’ at any stage. Yes, Sue and Mark have planned and created something very close to perfection. The Bower at Broulee is just off the George Bass Drive in Broulee. It’s on the NSW South Coast in the Eurobodalla region. It’s about 4 hours south of Sydney and just over 2 hours from Canberra. This is a wonderful area to stay for a while. The Bower is only 1km from Broulee beaches where swimming, surfing, snorkelling, stand up paddling and kayaking are all available. There are two beaches, one on the ocean side, the other bay side. Mogo and Moruya are within easy reach for dining and shopping options. 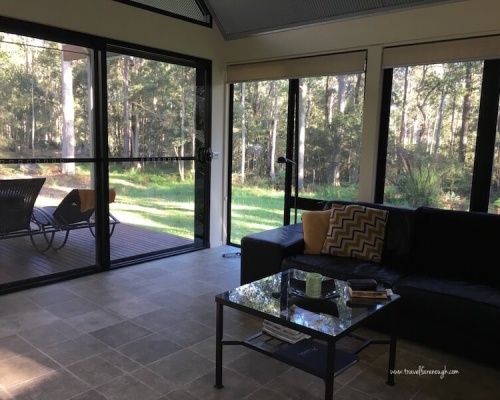 Bushwalking is available on the property. The Bower at Broulee is adjacent to the Illawong Nature Reserve. Other walks are available in the area, such as Broulee Island and Burrewarra Point. Fishing is a big draw in this area as well. 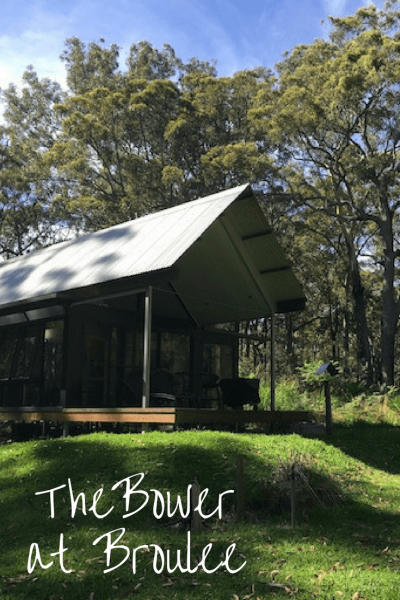 You can book the Bower at Broulee through this link. For more information about the Bower, check out their website and Facebook page. Please know that all reviews, whether sponsored or not, are honest accounts of our experience. Our readers are our priority. We will always provide you with clear, honest information and advice, so that you can have a successful travel experience. Want to leave a comment or a tip? Come on over to our Facebook community and start a conversation!